Frame, wheels, and crank are all carbon on this handsome steed. Mtbr first met the YT Industries Jeffsy prior to the 2016 Sea Otter Classic. Since then, we have put hundreds of miles and thousands of vertical feet on a CF Pro. Now it’s time to share our experience. The 2017 models have the same geometry, with just a few component changes, so this review is relevant if you’re thinking about perusing the YT website to order this year’s model. What did we think? Keep reading to find out. 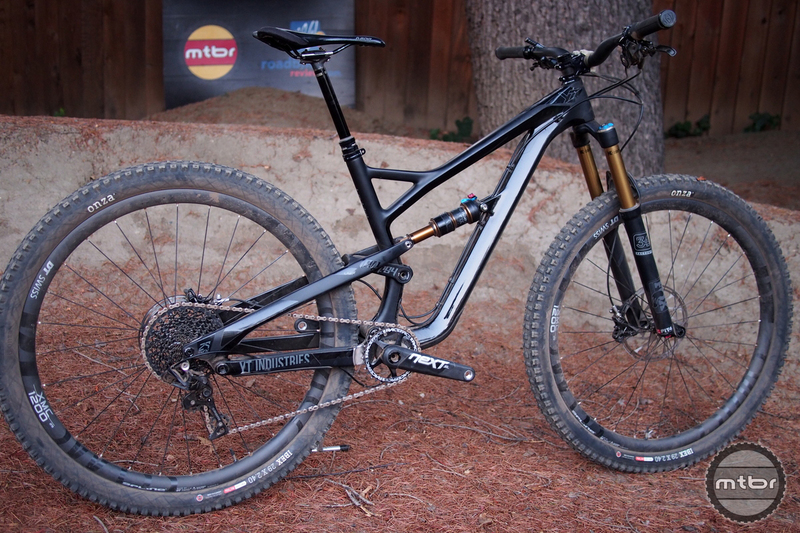 Mtbr has already published First Look and First Ride Review articles, so the various build kits are not covered here. In the First Ride Review, we were on the Comp 1 (you’ll see that in quite a few photos), but for this long term test, we rode the CF Pro. The two key differences are the CF Pro uses FOX instead of RockShox, and it has a lot more carbon in the build kit, resulting in about two pounds less weight (26.2 for the size large). Regardless of model, though, the Jeffsy remains a capable trail bike with 140mm of progressive travel. It’s a consumer-direct model so the bike is shipped directly to the consumer from the manufacturer. It’s a brave new world of bike shipping and bike assembly so we wrote a detailed article HERE about the packaging and assembly for the YT Jeffsy. We’re please to report that it is the best we’ve ever experienced. Weight was 26.15 pounds without pedals. That’s really light for a bike with this much ability. One thing that sets the Jeffsy apart is a highly progressive suspension found on all the YT bikes. Rear suspension should be viewed as a combination of the spring plus the frame’s suspension geometry. Combined, they provide an effective spring rate. With a progressive geometry, as you go farther into the bike’s travel, the leverage ratio compressing the spring reduces. A shorter lever arm means less force is being applied to the spring, so with identical springs, a more progressive suspension geometry takes more force to compress than a less progressive geometry. That yields a higher effective spring rate deep in the travel. So, why not just use a heavier spring? When shallow in the travel, we want the wheel to move easily. That allows the frame and rider to continue in a straight line, while the wheels deflect from small obstacles. The suspension lingo for that is small bump compliance. The two extremes for suspension are small bump compliance, where you want the suspension to move easily, versus landing a big jump or pushing hard into a berm, where you want the suspension to support a larger force. Either adding volume reducers to an air shock or a more progressive suspension geometry allows for that. I like the suspension geometry to be progressive for two reasons. The forces on the damper and spring are reduced, and greater small bump compliance is possible without compromising on big hit performance. As a heavier rider (~200lbs), balancing spring rate versus small bump compliance is a constant challenge. Setting recommended sag also means when pushing into the bike hard, it tends to bottom out even with significant low speed compression damping. I typically need to stuff air shocks with volume reducers, but with a progressive suspension geometry, I don’t have to. Drivetrain of choice for the Jeffsy is 1×11. When comparing the Jeffsy to the two other YT Industries bikes, they are obviously from the same lineage. Jeffsy has the linkage attached to the seat tube instead of the downtube, and uses a revised downtube path to allow fitment of a water bottle cage. The frame is all carbon, including seat and chainstays. The combination of internal and external routing simplifies replacing items like the rear brake, thus not requiring a re-bleed after completely removing the lever and lines. 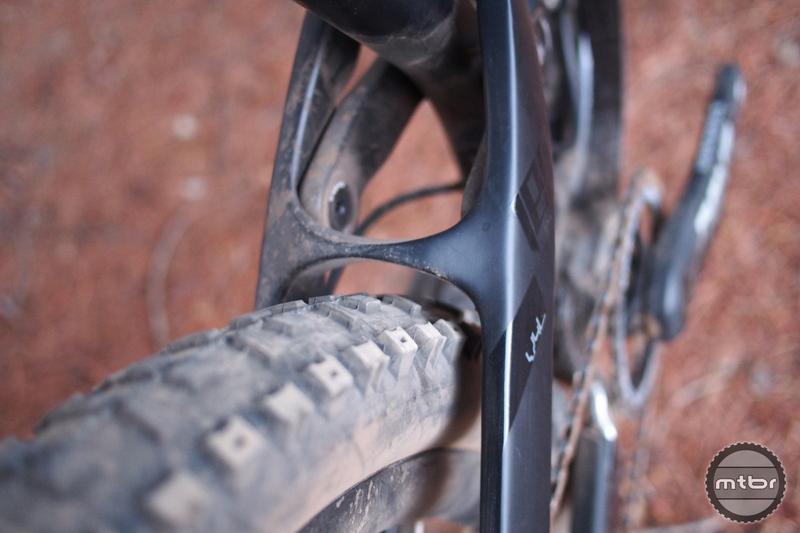 The dropper post routes externally on the downtube, then goes inside the seat tube to accommodate internal droppers, which simplifies running the cable. The rear derailleur cable is internally routed in both the downtube and chainstay. Attachment points for cable-securing zip-ties are well thought out. Frame protection is excellent, with metal protectors outside the cassette on the seatstay, front edge of the chainstay, and upper-front of the bottom bracket, all the contact points for dropped chains. My other bikes have scars in those areas, the Jeffsy does not. Molded rubber protectors can be found on the lower front of the downtube, inside the lower seatstay, and the top of the chainstay. Protection is located exactly where it is needed. The boost rear hub allowed frame’s designers to improve the chain line and add additional stiffness. An additional 3mm on the drive side might not sound like much, but given the clearance, it makes a huge difference. Boost is only in the back, with the front retaining 100mm hub spacing. 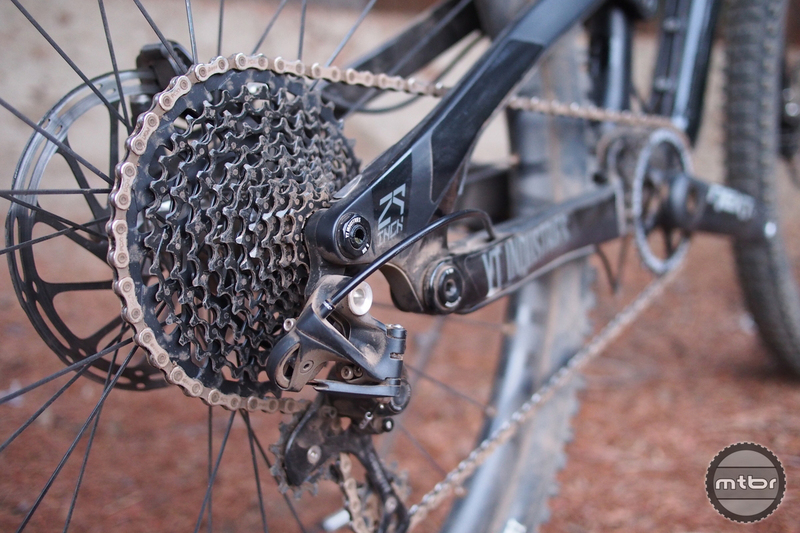 Clutch-style derailleurs have minimized chain drops, but they still happen. I’ve experienced four during my time on this bike, all but one during the “getting to know you” period of suspension and rider tuning. Fortunately, the E-Mount provides a simple and efficient method to add an upper guide to the bike. ISCG tabs are not included, but when using an upper-only guide, they are overkill anyway. Given the minimal weight, there is little reason not to add an upper guide. There is a flip-chip to increase the bottom bracket height and steepen the head tube slightly (from 66.8 to 67.6 degrees). It is located on the front of the chainstay, where the shock attaches. Tire clearance on the rear is adequate but definitely not plus tire compatible. Renthal was chosen for bars and stem, using the Fatbar Carbon 780mm width, 30.8mm diameter, 30mm rise bars paired to a 60mm Renthal stem (50mm is used for S/M frames). Race Face Love Handles grips adorn the bars (sadly Sensus grips were not used, but are for 2017). 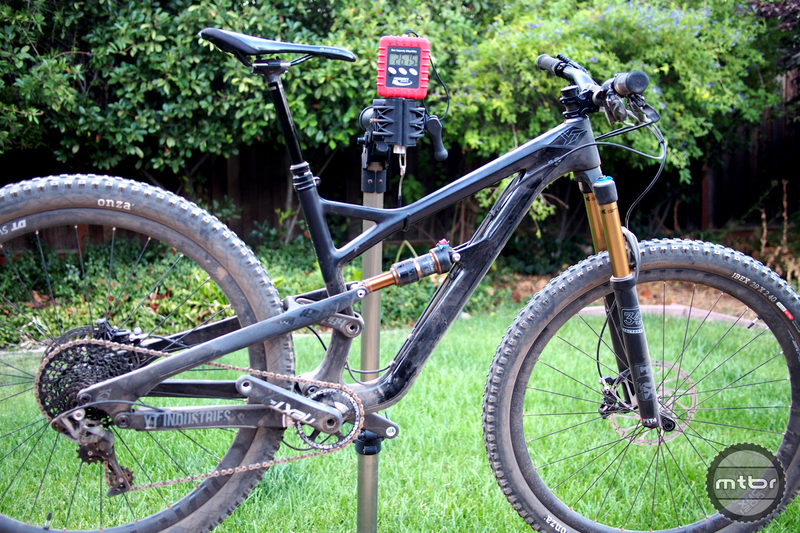 An SDG Circuit saddle sits atop a RockShox Reverb 150mm, 31.6mm dropper post. Most of this setup was retained, only swapping the saddle to a wider offering to support my hip bones. The stem is on the long side, particularly with the reduced offset fork. Personal preference would be a 35mm diameter carbon bars (available in the 2017 build kits) paired with a shorter stem. I’d also prefer the dropper lever to be below the bars to allow for a more natural motion when mounted on the left-hand side for 1x bikes. The drivetrain is a combination of SRAM and Race Face. On the CF Pro, carbon Race Face Next SL 175mm cranks are used with a 32T chainring and pass through a Race Face BB92 bottom bracket. SRAM X01 shifter and derailleur move the SRAM PCX1 chain across the 11-speed SRAM XG 1175 cassette. Again, SRAM was selected to provide their Guide Ultimate brakes and 200/180mm rotors. All gripes here are due to personal preferences alone. The spec’d chainring is a bit steep for mortal legs on a 29er. A normal water bottle doesn’t fit here so YT designed a custom one. Fox was utilized for the CF Pro’s springs and dampers. 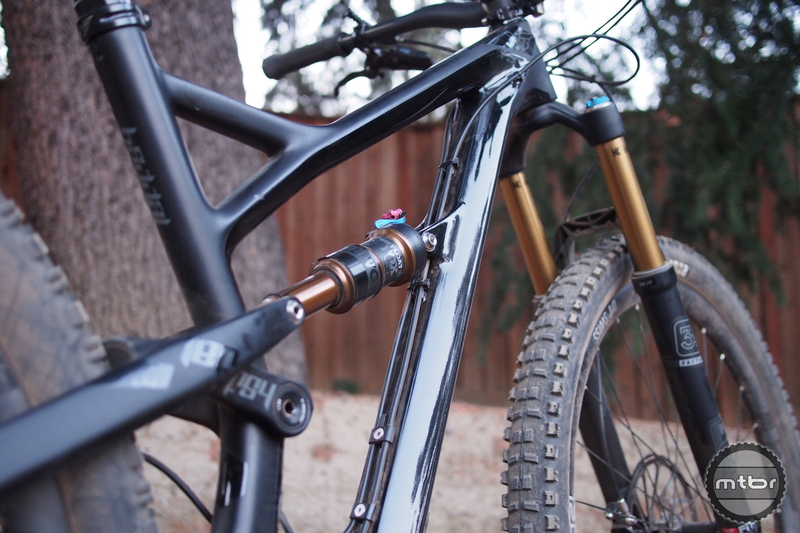 A 34 Float Factory fork is paired with the Float DPS Factory shock, both coated in Kashima. The fork uses a 100mmx15mm threaded thru-axle, and has a 44mm offset. Zero issues were encountered with the suspension. Love the looks of this bike but am scared to order due to sizing concerns. Sitting at 6’2″, I am right on the line between large and XL. Can you advise your height and what size you were on in the test. Any bikes that you would compare to for sizing? Niner RIP or Stumpy? Hi Jason – looks like Howie beat me to it! 🙂 I was on a large. Jason, i am 6’2′ as well. I rode both at the reno location. I chose an XL because i liked the extra reach, but you could really go either way. I was on an XL Santa Cruz and a L stumpy before that. With the XL you can shorten the stem if you want, but increasing the stem on the L would really detract from this bike’s strengths. get XXL tallboy, that be ideal! “Suspension Geometry” isn’t a thing.